Weight lossà Which may lead to progressive stupor à coma. The fluid buildup also makes the lungs heavy and stiff, and decreases the lungs' ability to expand. The level of oxygen in the blood can stay dangerously low, even if the person receives oxygen from a breathing machine (mechanical ventilator) through a breathing tube (endotracheal tube). Is a sudden decline in renal function, usually marked by increased concentrations of blood urea nitrogen (BUN; azotemia) and creatinine; oliguria (less than 500 ml of urine in 24 hours); hyperkalemia; and sodium retention. Prerenal failure – results from conditions that interrupt the renal blood supply; thereby reducing renal perfusion (hypovolemia, shock, hemorrhage, burns impaired cardiac output, diuretic therapy). 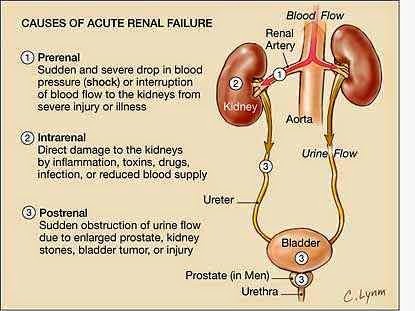 Postrenal failure – results from obstruction of urine flow. Intrarenal failure – results from injury to the kidneys themselves (ischemia, toxins, immunologic processes, systemic and vascular disorders). The disease progresses through three clinically distinct phase which is oliguric-anuric, diuretic, and recovery, distinguished primarily by changes in urine volume and BUN and creatinine levels. Complication of ARF include dysrhythmias, increased susceptibility to infection, electrolyte abnormalities, GI bleeding due to stress ulcers, and multiple organ failure. Untreated ARF can also progress to chronic renal failure, end-stage renal disease, and death from uremia or related causes. Oliguric-anuric phase: urine volume less than 400 ml per 24 hours; increased in serum creatinine, urea, uric acid, organic acids, potassium, and magnesium; lasts 3 to 5 days in infants and children, 10 to 14 days in adolescents and adults. Diuretic phase: begins when urine output exceeds 500 ml per 24 hours, end when BUN and creatinine levels stop rising; length is availabe. Recovery phase: asymptomatic; last several months to 1 year; some scar tissue may remain. In prerenal disease: decreased tissue turgor, dryness of mucous membranes, weight loss, flat neck veins, hypotension, tachycardia. In postrenal disease: difficulty in voiding, changes in urine flow. In Intrarenal disease: presentation varies; usually have edema, may have fever, skin rash. Nausea, vomiting, diarrhea, and lethargy may also occur. Urinalysis shows proteinuria, hematuria, casts. Urine chemistry distinguishes various forms of ARF(prerenal, postrenal, intrarenal). Serum creatinine and BUN levels are elevated; arterial blood gas (ABG) levels, serum electrolytes may be abnormal. Renal untrasonography estimates renal size and rules out treatable obstructive uropathy. Surgical relief of obstruction may be necessary. Correction of underlying fluid excesses or deficits. Correction and control of biochemical imbalances. Restoration and maintenance of blood pressure through I.V. fluids and vasopressors. Maintenance of adequate nutrition: Low protein diet with supplemental amino acids and vitamins. Initiation of hemodialysis, peritoneal dialysis, or continuous renal replacement therapy for patients with progressive azotemia and other life-threatening complications. Monitor 24-hour urine volume to follow clinical course of the disease. Monitor BUN, creatinine, and electrolyte. Monitor ABG levels as necessary to evaluate acid-base balance. Weigh the patient to provide an index of fluid balance. Measure blood pressure at various times during the day with patients in supine, sitting, and standing positions. Adjust fluid intake to avoid volume overload and dehydration. Watch for cardiac dysrhythmias and heart failure from hyperkalemia, electrolyte imbalance, or fluid overload. Have resuscitation equipment available in case of cardiac arrest. Watch for urinary tract infection, and remove bladder catheter as soon as possible. Employ intensive pulmonary hygiene because incidence of pulmonary edema and infection is high. Offer high-carbohydrate feedings because carbohydrates have a greater protein-sparing power and provide additional calories. Institute seizure precautions. Provide padded side rails and have airway and suction equipment at the bedside. Encourage and assist the patient to turn and move because drowsiness and lethargy may reduce activity. Explain that the patient may experience residual defects in kidney function for a long time after acute illness. Encourage the patient to report routine urinalysis and follow-up examinations. Recommend resuming activity gradually because muscle weakness will be present from excessive catabolism. All patients with ARF need an understanding of renal function,signs and symptoms of renal failure ,and how to monitor their own renal function. Patients who have recovered viable renal function still need to be monitored by a nephrologist for at least a year. Teach the patient that she or he may be more susceptible to infection than previously. Advise daily weight checks. Emphasize rest to prevent overexertion. Teach the patient or significant others about all medications, including dosage, potential side effects, and drug interactions. 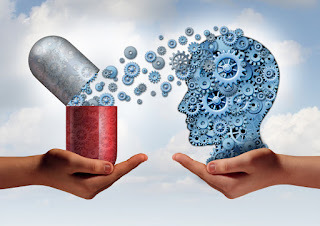 Explain that the patient should tell the healthcare professional about the medications if the patient needs treatment such as dental work or if a new medication is added. Explain that ongoing medical assessment is required to check renal function. Explain all dietary and fluid restrictions. Note if the restrictions are life-long or temporary. Patients who have not recovered viable renal function need to understand that their condition may persist and even become chronic. If chronic renal failure is suspected, further outpatient treatment and monitoring are needed. Discuss with significant others the lifestyle changes that may be required with chronic renal failure. 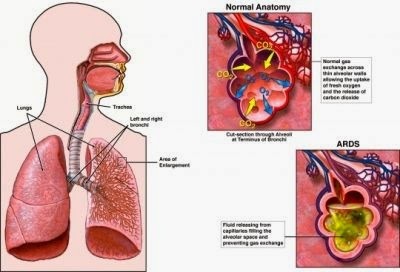 Is an infection of the lower respiratory tract that generally follows an upper respiratory tract infection. As a result of this viral (most common) or bacterial infection, the airways become inflamed and irritated, and mucus production increases. 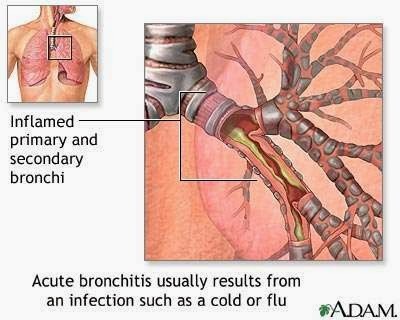 Acute bronchitis is usually caused by viruses. Established risk factors include a history of smoking, occupational exposures, air pollution, reduced lung function, and heredity. Children of parents who smoke are at higher risk for pulmonary infections that may lead to bronchitis. Fever, tachypnea, mild dyspnea, pleuritic chest pain (possible). Cough with clear to purulent sputum production. Diffuse rhonchi and crackles(contrast with localized crackles usually heard with pneumonia). Chest X-ray may rule out pneumonia. In bronchitis, films show no evidence of lung infiltrates or consolidation. Chest physiotherapy to mobilize secretions, if indicated. Inhaled bronchodilators to reduce bronchospasm and promote sputum expectoration. A course of oral antibiotics such as a macrolide may be instituted, but is controversial. Symptom management for fever and cough. Encourage mobilization of secretion through ambulation, coughing, and deep breathing. Ensure adequate fluid intake to liquefy secretions and prevent dehydration caused by fever and tachypnea. Encourage rest, avoidance of bronchial irritant, and a good diet to facilitate recovery. Instruct the patient to complete the full course of prescribed antibiotics and explain the effect of meals on drug absorption. Caution the patient on using over-the-counter cough suppressants, antihistamines, and decongestants, which may cause drying and retention of secretions. However, cough preparations containing the mucolytic guaifenesin may be appropriate. Advise the patient that a dry cough may persist after bronchitis because of irritation of airways. Suggest avoiding dry environments and using a humidifier at bedside. Encourage smoking cessation. Teach the patient to recognize and immediately report early signs and symptoms of acute bronchitis. Medications. Be sure that the patient understands all medications, including the dosage, route, action, and adverse effects. Patients on aminophylline should have blood levels drawn as ordered by the physician. Before being discharged from the hospital, the patient should demon- strate the proper use of metered-dose inhalers. Complications. Instruct patients to notify their primary healthcare provider of any change in the color or consistency of their secretions. Green-colored secretions may indicate the pres- ence of a respiratory infection. Patients should also report consistent, prolonged periods of dyspnea that are unrelieved by medications. Follow-up. Consider that patients with severe disease may need assistance with activities of daily living after discharge. 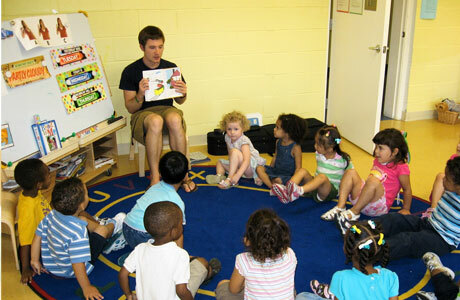 Note any referrals to social services. Send patients home with a diet, provided by the dietitian and reinforced by the nurse, which provides a high-caloric intake. Encourage the patient to cover the face with a scarf if he or she goes out-of-doors in the winter. If the patient continues to smoke,provide the name of a smoking cessation program or a support group. Encourage the patient to avoid irritants in the air. 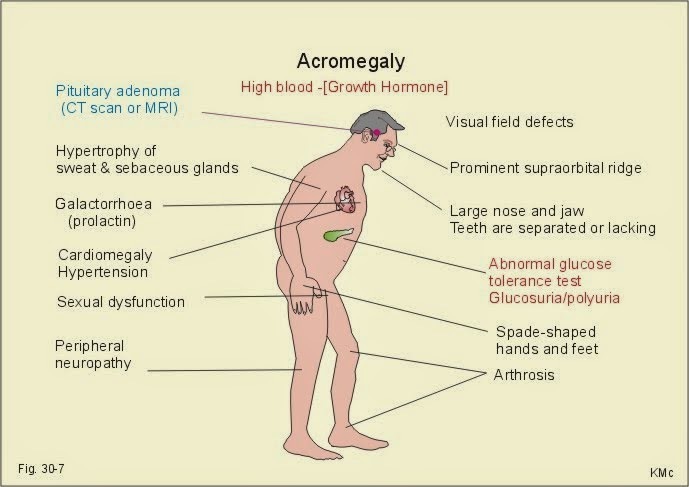 Acromegaly is a rare, chronic, and disabling disorder of body growth and endocrine dysfunction in adults (after closure of the epiphyses) that is caused by excessive levels of growth hormone (GH). It occurs in approximately 40 persons per million. In adults, it is almost always due to a growth hormone–secreting pituitary adenoma. The excess production of GH causes enlargement of tissues and an altered production of glucocorticoids, mineralocorticoids, and gonadotropins. Left untreated, acromegaly causes gross physical deformities, crippling neuromuscular alterations, major organ dysfunctions, and decreased visual acuity. Arthritis or carpal tunnel syndrome may also develop. 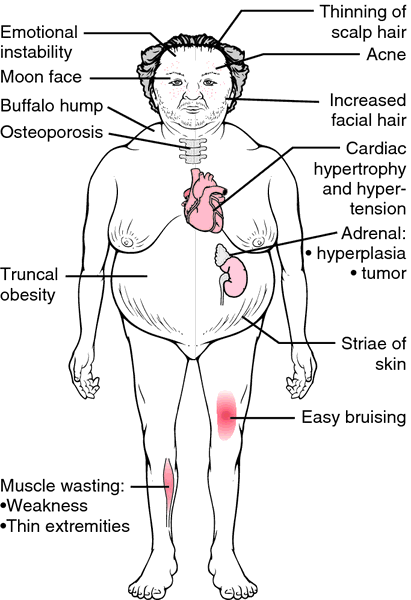 Acromegaly increases an individual’s risk for heart disease, diabetes mellitus, and gallstones. The resultant cardiac disease reduces life expectancy. The overproduction of GH is a result of hyperpituitarism. More than 90% of patients have a pituitary adenoma. The etiology of adenomas is unknown. Hyperpituitarism can also occur with lung, gastric, breast, and ovarian cancers and may have a genetic cause. While most cases of acromegaly are not inherited, mutations in the GNAS1 gene can cause GH secreting pituitary adenomas (somatotrophinomas). These can be transmitted in an autosomal dominant pattern. Familial acromegaly may also be a feature of multiple endocrine neoplasia type I (MEN I), an autosomal dominant disorder that includes peptic ulcer disease and pituitary, parathyroid, and pancreas endocrine abnormalities. Diagnosis of acromegaly usually occurs after the age of 40 in men and 45 in women, and occurs more frequently in women than in men. Ethnicity and race have no known effects on the risk for acromegaly. Some rare cases of acromegaly are hereditary. The average age of diagnosis is 40-45 years old. Symptoms usually develop very slowly over time. Acromegaly can cause serious complications and premature death if not treated. 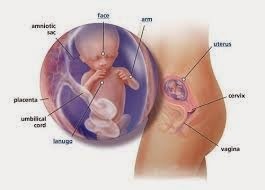 In children, excess GH production causes elongation of the bones and associated soft tissue swelling. 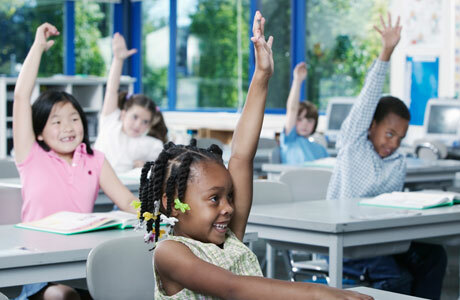 If not treated, children with this disorder can grow ta height of 7-8 feet. Blood tests will be done to measure the level of insulin-like growth factor (IGF-I), growth hormone releasing hormone (GHRH) , and other pituitary hormones. A glucose tolerance test may all be given to see if the GH level drops—it will not drop in cases of acromegaly. Surgical removal of the pituitary tumor, or other tumor, that is believed to be causing acromegaly may be done. In most cases, this is the preferred treatment. Radiosurgery is the use of highly focused external beams of radiation to shrink the tumor. 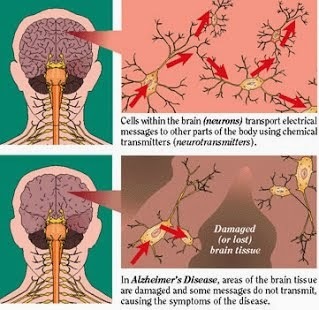 It is used most often in patients which do not respond to conventional surgery or medications. Radiation therapy is used in combination with either medical and/or surgical treatment. Medications must often be combined with other therapies treat larger tumors affecting surrounding structures. PREOPERATIVE. At the time of diagnosis, the patient requires education and emotional support. 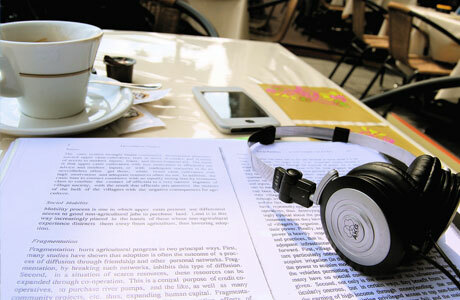 Focus education on the cause of the disease, the prescribed medical regimen, and preparation for surgery. Encourage the patient to interact with family and significant others. Reassure the patient that treatment reverses some of the physical deformities. If you note disabling behavior, refer the patient to psychiatric resources. Prepare the patient and family for surgery. Explain the preoperative diagnostic tests and examinations. For a patient who is undergoing a transsphenoidal hypophysectomy or a transfrontal craniotomy, explain the postoperative need for nasal packing and a mustache dressing. POSTOPERATIVE. Elevate the patient’s head to facilitate breathing and fluid drainage. Do not encourage the patient to cough, as this interferes with the healing of the operative site. Provide frequent mouth care, and keep the skin dry. To promote maximum joint mobility, perform or assist with range-of-motion exercises. Encourage the patient to ambulate within 1 to 2 days of the surgery. To assure healing of the incision site, explain the need to avoid activities that increase intracranial pressure, such as toothbrushing, coughing, sneezing, nose blowing, and bending. Refer patients with advanced acromegaly who experience arthritic changes and require assist devices for ambulation and activities of daily living to a physical therapist. ACTIVITY RESTRICTIONS. Instruct the patient to avoid activities that increase intracranial pressure for up to 2 months after surgery. Toothbrushing can be resumed in 2 weeks. 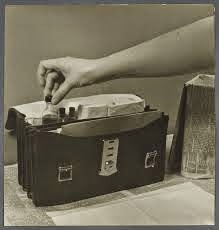 Instruct the patient to report increased nasal drainage. Incisional numbness and altered olfaction may occur for 4 months after surgery. MEDICATIONS. If octreotide is prescribed, the patient will need to be able to demonstrate how to administer a subcutaneous or intramuscular injection. FOLLOW-UP. Patients need to be monitored for development of cardiac disease, diabetes mellitus, and gallstones and a recurrence of symptoms. Advise the patient to wear a medical identification bracelet. An act providing incentives to government and private health institutions promoting and practicing rooming-in and breast-feeding. Provision for human milk bank.